Contrary to popular belief, containers are neither square, level, nor plumb. The weight of five other containers stacked above causes them to bow out over the years. They are built to general specifications, but we found a fair bit of variation in ours – tolerances up to an inch or so of deviation. In order to preserve as much interior space as possible, we used 2×2 studs on the interior. They were too slender for the 8 ft. span, so we welded on an angle bracket at the middle of the stud for reinforcement. 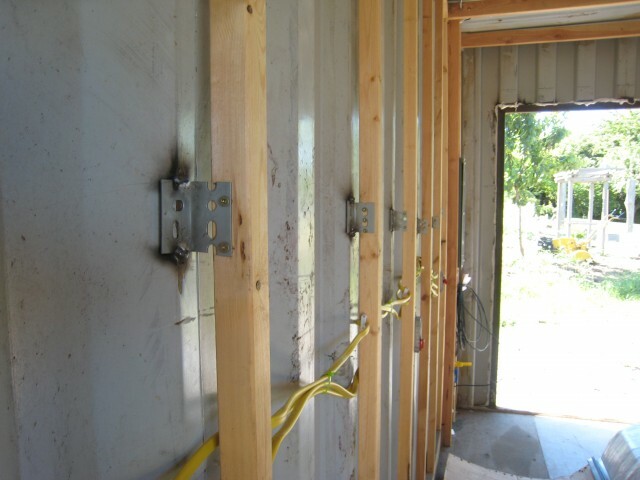 We then ran our wiring behind the studs using the wall corrugations as additional maneuvering room. We used 2×4’s to support the ceiling (While the walls are designed for strength, the roof is designed simply to keep the water out. It is constructed of thin gauge steel similar to that of a car roof. Since the container floor carries all the load, even when stacked, there is no direct load on the roof. The electrical panel required a deeper wall cavity to contain the box and conduit, so we boxed it in with 2×4’s instead of 2×2’s. over the world). If you’re concerned about your health, consider encapsulating the existing floor by covering it with a finish floor. We wedged all the framing inside the existing shell. We made firm attachment to the floor, but kept our attachments to the steel to a minimum. Any penetrations through the structure could result in water intrusion over time.